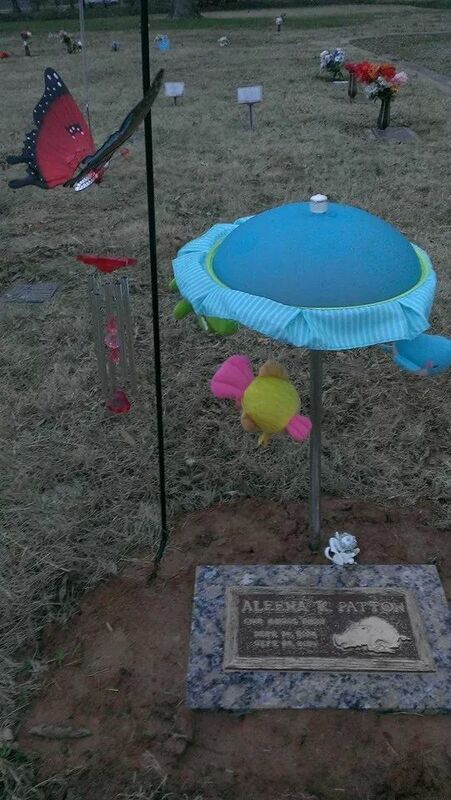 ~ In Loving Memory Of My Daughter, Aleena Kay Patton! Taken too soon by Osteogensis Imperfecta Type II. First let me say that the prices may vary based on each funeral home, but all of the fees charged will remain the same 99% of the time! 1. Funeral Homes charge a “BASIC SERVICES FEE“. This fee includes things like, funeral planning, securing the necessary permits and copies of death certificates, preparing the notices, sheltering the remains, and coordinating the arrangements with the cemetery, crematory or other third parties. This fee does NOT include charges for optional services or merchandise. The funeral home we used provided all of those things FREE OF CHARGE. But, we still had to make decisions on how the notices would look and what they would say. The notices are little card-like papers that will have your baby’s name, date of birth/date of passing, obituary, and will have a little prayer, poem or something similar in them and will be handed out at the viewing/service or where you decide. We were given the option to choose and chose a special poem for Aleena’s and they were passed out to our family and friends at her viewing. You will still have to decide on a burial or cremation and then on the cemetery or crematory! 2. Funeral Homes charge a fee for “OTHER SERVICES AND MERCHANDISE“. This fee includes the cost for things like, optional goods and services such as, transporting the remains. Embalming and other preparation. 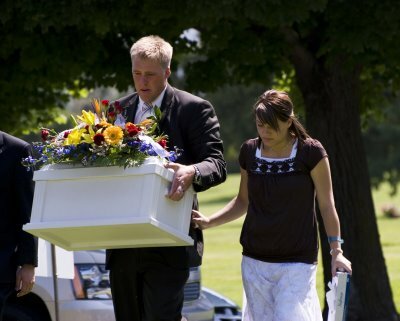 Use of the funeral home for the viewing, ceremony or memorial service. Use of equipment and staff for a graveside service. Use of a hearse or limousine. A casket, outer burial container or alternate container. Cremation or interment. The funeral home we used provided all of those things for free, except for the use of a limousine or family car, which is used to transport the family from the funeral to the cemetery. They only transported Aleena to the cemetery and we drove in our own cars. That is an option for you! We still had to make the decision of having her embalmed or not. We were told that by law in Arkansas, after 24 hours, if the embalming has not been done, then it will NO LONGER be an option and you will NOT have the choice of an open casket. So keep that in mind, it is your personal choice. If you decide you want a closed casket for the services, then embalming is not required! We had to decide what kind of service/funeral we wanted to have for Aleena. We chose to have an open casket viewing/visitation on a Wednesday night for all of our family and friends to come too and then a short graveside ceremony the next morning for only our immediate family. That is also your personal choice. You can choose to have any type of service you like, religious, simple, just family, family and friends, not have a service at all, but just a viewing/visitation, where people can just come and say their goodbyes, short and sweet. Just a graveside service,or you can choose to not do any of that and have an immediate burial or cremation. Again your own choice! We did NOT get to choose Aleena’s casket, it was already chosen and provided for us. If we wanted a different one, instead of the one provided for free, we would have had to purchase one. 3. Funeral homes charge “CASH ADVANCES” for goods or services that they must purchase from an outside vendor on your behalf. Such as, flowers, obituary notices, pallbearers, officiating clergy, and organists and soloists. Some funeral homes will only charge you the exact cost that they will have to pay for the items they buy on your behalf. Others add a service fee to the cost. “soft, baby-like” tune playing in the background, for our family and friends to watch and see. We did have to pay for them to make the disk for us, which meant getting all of the pictures we wanted put onto a DVD and adding the music to it. They charged $30.00 for 30 pictures, but we went over 30 and paid the difference. But like I said at the beginning of the post, prices will vary based on the funeral home you choose. And keep in mind that some people know how to make a DVD like that on their own, so if you know how or know someone who does, then you wouldn’t need to pay for the funeral home for it. Flowers were not provided for free for us, but some of our family/friends purchased flowers on their own for us and the viewing, so we did not need to ask the funeral home to provide them and so it did not cost us anything. Keep in mind that a lot of your friends and family will want to help out in whatever way they can during this time, don’t be afraid to tell them what you really need help with. If you need/want flowers, ask them for that instead of food (which is what people usually give when a loved one passes)! Or another option is to go check out different florists on your own, find the cheapest place and purchase them yourself, then you don’t have to worry about if the funeral home is charging you an extra fee for going and getting the flowers for you. Or you can choose to not have flowers at all! Another choice to make. And let me just say that, even though flowers didn’t even cross our mind during the rush and stress of trying to get everything done and arranged in such a short amount of time, we were VERY thankful that our family/friends did think to get us some, because they were beautiful sitting all around her during the viewing and they were something that we could leave behind for her and with her at the cemetery! Just like with funeral homes, prices will vary based on the cemetery you choose, but the fees charged will be the same 99% of the time! 1.Buying a plot (the grave space) from a cemetery can be VERY expensive! Whether you choose for your loved one to be buried in the ground or a mausoleum (above ground wall-like graves), both can end up costing you a lot of money just for the space, so you should really call around before buying! Most cemeteries have a special area just for babies/infants that have passed on and it may not cost as much as a usual plot, so when you call make sure you let them know if it is your baby that you are laying to rest! The cemetery we used for Aleena did NOT charge us for this fee. Her plot was picked and provided for us, in their special spot for babies/infants called “Baby Land”. 2.There is a separate charge for “OPENING AND CLOSING”. This means that they charge you to open or “dig” the plot, to put your loved one inside and then to “fill it back in” or close it. This can be a VERY expensive charge, usually a couple of hundred dollars. Some of the cemeteries I found were going to charge us a $200 fee for this, which is cheaper than for an adult, but still very expensive, when you don’t really have a lot of money. The cemetery we ended up using did NOT charge us for this fee. They had it all ready to go for us when we got there for Aleena’s graveside service and then filled it back in before we left the cemetery! So make sure you call around!! You may find some cemeteries that will offer the plot free, but charge you for the opening and closing or vise versa, or you could find one as amazing as the one we found and have it all provided free of charge! 3.If you choose to have your loved one cremated and buried in a mausoleum or columbarium, you can expect to purchase a crypt and pay the opening and closing fees! May not charge a fee for unauthorized embalming, unless embalming is required by law in your state or for your situation. Must disclose that you usually have the choice of disposition, such as, direct cremation or immediate burial, which does not require embalming, unless you want it. Must disclose that some funeral arrangements, such as a funeral with a viewing, may make embalming a practical necessity and/or be required by law, which would make it a required purchase. A casket often is the single most expensive item you’ll buy if you plan a “traditional” full-service funeral. Caskets vary widely in style and price and are typically constructed of metal, wood, fiberboard, fiberglass or plastic. Caskets can range, on AVERAGE, anywhere from $2,000 to $10,000, depending on size, style and what they are made of. When you visit a funeral home or showroom for a casket, they are required to show you a list of caskets the company sells, with descriptions and prices! If you haven’t seen some of the lower-priced models on the price list, ask to see them, but don’t be surprised if they’re not prominently displayed, or not on display at all. Traditionally, caskets have been sold only by funeral homes. But more and more, showrooms and websites operated by “third-party” dealers are selling caskets. You can buy a casket from one of these dealers and have it shipped directly to the funeral home. Funeral homes are required to agree to use the casket that you purchased elsewhere and they are not allowed to charge you a fee for using it! No matter where or you buy a casket, it’s important to keep in mind the real purpose of the casket! Which is, to provide a way of moving the body before cremation or burial. Also remember that, no casket, regardless of its cost or what it is made of, will preserve a body forever. Some caskets may be described as, “gasketed,” “protective” or “sealer” caskets. That means that it has a rubber gasket or some other feature that is designed to delay the penetration of water into the casket and prevent rust. Casket providers are not allowed to claim that these special features will help preserve the body FOREVER, because they DO NOT! They only add to the cost of the casket. Many families that choose to have their loved ones cremated, rent a casket from the funeral home for the visitation and funeral, eliminating the cost of buying a casket. So, if you choose to have a visitation and cremation, ask about the rental option! For those who choose a direct cremation without a viewing or other ceremony where the body is present, the funeral provider must offer an inexpensive unfinished wood box or alternative container, a non-metal enclosure, that is cremated with the body. May not tell you that state law requires a casket for direct cremation, because NONE do! Must disclose your right to buy an unfinished wooden box or other alternative container for direct cremation. Must make an unfinished wooden box or other alternative container for direct cremation available for purchase. Burial vaults or grave liners, also known as burial containers, are commonly used in “traditional” full-service funerals. The vault or liner is placed in the ground before burial, and the casket is lowered into it at burial. The purpose of the vault or liner is to prevent the ground from caving in as the casket deteriorates over time. State laws do not require a vault or liner, and funeral providers are not allowed tell you otherwise! But, some cemeteries may require some type of outer burial container to prevent the grave from sinking in the future. Grave liners and burial vaults are NOT designed to prevent the eventual decomposition of human remains! It is illegal for funeral providers to claim that a vault will keep water, dirt, or other debris from penetrating into the casket if that is not true! Before showing you any outer burial containers, a funeral provider is required to give you a list of prices and descriptions. It may be less expensive to buy an outer burial container from a third-party dealer than from a funeral home or cemetery, so if you choose to have one, make sure you look around! Even though it may not be what you want to hear, you have to keep in mind the truth! As far back as the ancient Egyptians, people have tried anything and everything that they could think of to preserve a body in the grave forever. Yet, here we are in 2014 and it is still NOT possible! It is just not something that is supposed to be done or someone would have found a way to do it by now. A funeral director/provider is prohibited from trying to tell you that it can be done. For example, they may not claim that either embalming or a particular type of casket will preserve the body of the deceased for an unlimited time., because again, it CAN NOT be done. Yet, some may still try to sell you on it, so just keep in mind the truth, even if it is hard to accept! 7.Last but not least, I wanted to let you know if you don’t already know.. 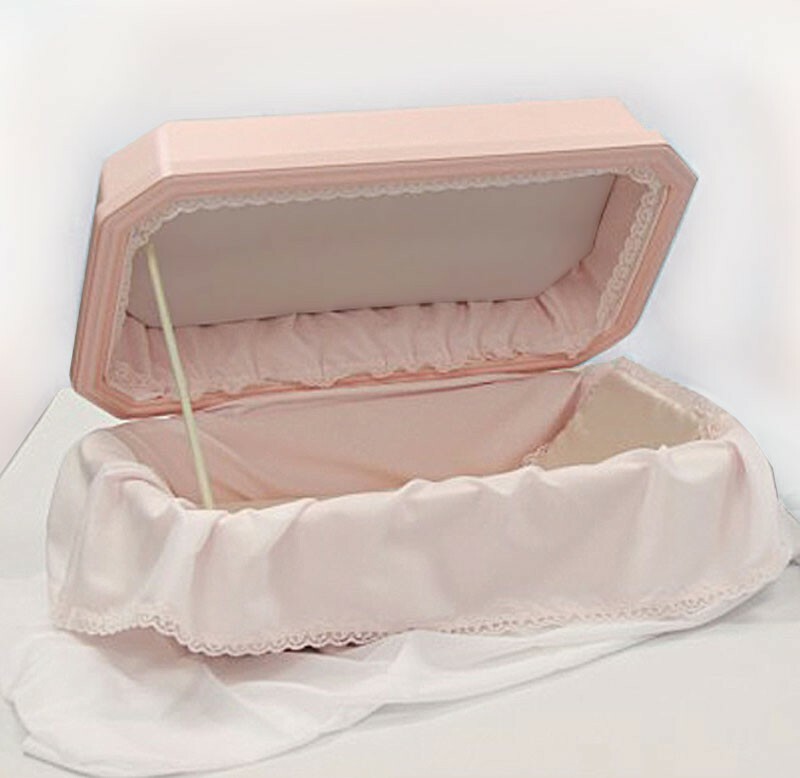 The funeral home should allow you to place a special item or items into the casket with your loved one! We chose to place a mini Arkansas Razorbacks #1 fan foam finger and a Razorback T-shirt of her Daddy’s that I also were occasionally, so that she had something from us with her! So, make sure you ask, if that is something that you want to do! I really hope that this information may be helpful to you, whether you are having to plan the funeral of your baby or some other loved one, whether you are receiving the services for free or you are having to pay for it, I just hope that you keep it all in mind and it helps in some way! If you have anymore questions, feel free to comment or contact me privately by email and I will do my best to give you the answers you need! My due date is approaching but my baby is already gone..
One Month Has Passed, Yet It Still Feels Like It Was Just Yesterday! Enter your email address to follow this blog and stay up to date on new posts by email. Feel free to contact me for whatever reason! Questions? Need Information? Having a tough time and just need to talk? Know someone who is having a hard time and need advice? CONTACT ME! For any of those reasons or any other reason and I will do my best to answer or help in anyway that I can!